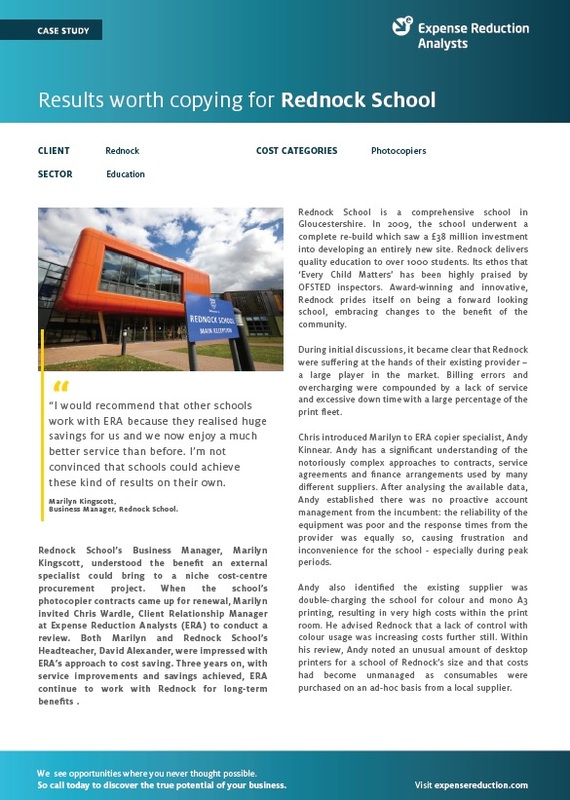 Rednock School’s Business Manager, Marilyn Kingscott, understood the benefit an external specialist could bring to a niche cost-centre procurement project. When the school’s photocopier contracts came up for renewal, Marilyn invited Chris Wardle, Client Relationship Manager at Expense Reduction Analysts (ERA) to conduct a review. Both Marilyn and Rednock School’s Headteacher, David Alexander, were impressed with ERA’s approach to cost saving. Three years on, with service improvements and savings achieved, ERA continue to work with Rednock for long-term benefits. Rednock School is a comprehensive school in Gloucestershire. In 2009, the school underwent a complete re-build which saw a £38 million investment into developing an entirely new site. Rednock delivers quality education to over 1000 students. Its ethos that ‘Every Child Matters’ has been highly praised by OFSTED inspectors. Award-winning and innovative, Rednock prides itself on being a forward looking school, embracing changes to the benefit of the community. For more information, including the specific savings and practical changes made for Rednock, download the full case study now. Marilyn Kingscott, Business Manager, Rednock School. If you would like to know more about how ERA can help your organisation, contact us today to learn more.